On December 5, 2005 we closed on our first home purchase. 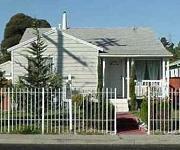 We paid $399,900 and considering the Bay Area home market I think this was a good price. 1 story, 2 bedroom, 1 bath, detached garage. Dining room. Laundry area. Ignore the "sinks" in the two corners of the left bedroom. We wanted to make sure our corner desks would fit in the room with room left over for sewing. Corner sinks were the only corner-filling widget in the application. Because it was built in 1948.. I'm hesitant to say "it's a bungalow" ("real" craftsman bungalows were built from 1890-1930). It has many bungalow features.. and I feel it can be tweaked to more closely resemble a bungalow. So for now it has "Bungalow Dreams". Maybe once we update the trim, add a fireplace, and maybe a built-in or two I'll be able to say it -is- a bungalow... regardless of when it was built. I plan (in 7-10 years) to resell the place with "many craftsman details". Cross your fingers for me. Marc and Monica (nibuca) live in the little grey house that dreams of being a bungalow with "Fynriss" and "Tiggy", whippets; and "Sweet Pea" and "Spot", cockatiels.